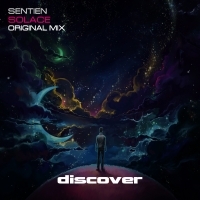 Our next outing on Discover is the talented Sentien with Solace. Solace truly is a tune of outstanding beauty with melodies that remind us of the talented pioneering electronic producers from years gone by. Strong hooks with a very cool analog feel feature throughout giving Solace a warm glow that adds to the strong bass and percussion that ensure the tune still keeps one eye firmly on the dancefloor. Unashamedly massive, Sentien delivers big room trance with his own unique style.